Chino Hills has launched their city’s app this week. Chino Hills is a prosperous town tucked into the rolling hills of the southwesternmost corner of San Bernardino County in Southern California. Known for its high quality of life and sweeping rural views, it is considered one of California’s best kept secrets. With its 43 parks, 39 miles of trails and 16 trailheads, Chino Hills is making excellent use of enhanced GIS (Geographical Information System) mapping. Our interactive mapping actually shows the location of the user on the trail in real time. Citizens who enjoy walking, hiking, running, bicycling and riding horses can use the app to map out their journey and check their location any time while out on the trails. From the trail and beyond, citizens are able to report any and all issues they may come across with our Report An Issue system. With just a few taps on their mobile device a citizen can instantly submit a report detailing the issue and the location with the option to include photos and know that their concern will be addressed by city staff in a timely and efficient manner. Our goal here at Civic is heightened civic engagement; citizens connecting with their city and its officials and representatives like never before. We are delivering this to the City of Chino Hills through important features like access to news and social media posts, easy-to-find and use government and recreation modules, and even a Pet Adoption section. 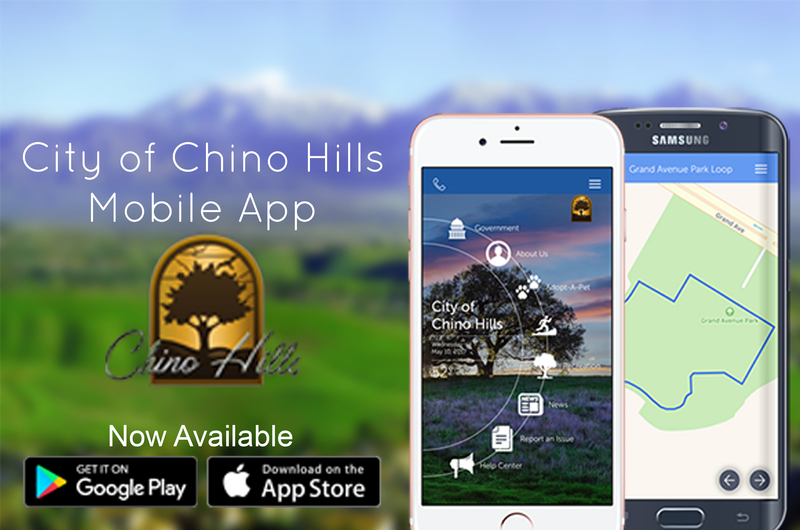 We are excited to have Chino Hills as the newest member of the MyCivic Apps family!